Daniil Kvyat named Rookie of the Year by Britain's Autosport website. Daniil Kvyat. Source: Getty Images / Fotobank. Racing for Toro Rosso, Kvyat, 20, scored eight points in 19 Formula 1 races in 2014, reaching the 15th standing. Next season, he will be driving for Austrian team Red Bull. Autosport's prize for the best International Driver of the year went to Formula 1 champion Lewis Hamilton, who races for Mercedes. "It's been a great year and it's gone by so fast. 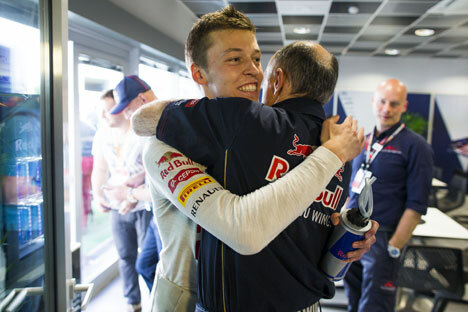 I've been lucky to work with some great people at Toro Rosso. My first race was very special," Kvyat said when he picked up his award at an International Motoring Federation (FIA) gala in Doha. The young driver also won a similar FIA award. The best rookie was selected from all FIA series, with votes cast by former and current drivers in different championships. FIA named the Russian Grand-Prix in Sochi as the best Formula 1 race of 2014.